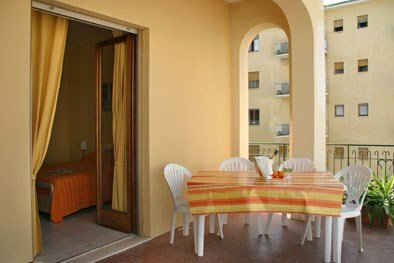 Apartment located in Sorrento centre near shops and restaurants.... it's perfect for your family holidays!!! Central apartment located in Sorrento, tourist location famous for its natural beauties and close to other exclusive resorts like the Island of Capri, Positano, Amalfi. Everything is at hand: restaurants, bars, shops, boutiques on the main road. The sea is at a distance of 700 metres, port with fast hydrofoils for excursions at 700 metres, railway station at 300 metres. Ample three-roomed apartment recently renovated, situated on the 3rd floor with lift and consisting of: entrance, 1st bedroom with double bed and single bed, another bedroom with 2 bunk beds, living/dining room, table and chairs, kitchenette and access to the balcony. Bathroom with a shower. 3rd bedroom with double bed and 2 single beds. Another living room with double sofa bed and kitchen. Direct access to the second balcony. Bathroom with shower. Sleeps 9; with double sofa bed sleeps 11. Important note: Possibility to let this apartment code T341 A with another apartment nearby (code T246), for a total of 15 people. Water, electricity, gas, weekly cleaning and change of linen, fridge, freezer, oven, satellite TV, air-conditioning and heating. Car parking in resort, or public car park at a distance of 100 metres. The splendid town of Sorrento is full of shops, restaurants, bars, boutiques, discos and the theatre where you can see the Tarantella Show. Only 5 minutes walk away from Tasso Square, the main square in Sorrento, there is the train station should you like a trip to Pompeii, Herculaneum and Vesuvius. And more conveniently, about 300 metres from Tasso square you will find the hydrofoil port to enable you to take trips to the Island of Capri, Ischia, Procida and Naples. There is also 3 single sofa beds in 1 proper single bed in the first bedroom. 2 proper single beds in the second bedroom. Services included in the price Water, electricity, gas, weekly cleaning and change of linen, fridge, freezer, oven, satellite TV, air-conditioning and heating. Services not included in the price Car parking in resort, or public car park at a distance of 100 metres.